As American breeder and judge Darrel Sherow wrote in his 1990 book, 'The East Indie Duck', there is no breed of domestic duck whose origin is so shrouded in mystery that that of the East Indie. It was first written about in the USA in the early 1800s and the UK from the 1830s so it has been in existence some time. It could have been developed from a northern Mallard sport though others favour the explanation that the black gene may have arrived via the American black duck. Whatever the explanation, due to it's striking plumage it became a firm favourite on the show bench. It does share it's colour with the Cayuga which was developed in North America. The striking black plumage is overlaid with a glossy, beetle- green sheen and there should not be any white feathers in sight although older females may develop some. The aim is for a solid colour. The bill and legs are black and the the eyes dark brown. It is an excellent flier and rather flighty and many consider it a good idea to view it management wise as a semi wild fowl rather than the domestic duck of its classification. It's not a good egg layer so it is kept for ornament and for exhibition which doesn't make it a back yard bird or smallholding choice. Interestingly the first eggs that it does lay can be covered in a sooty black deposit but as time goes on they will be a uniform dull white. It needs access to water to keep its plumage perfect and if you want to breed, keep as a trio or pair. It is a bantam classification and comes in only the one spectacular colour. 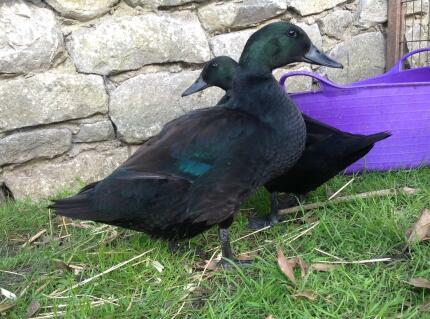 I have a few breeding pairs of these ducks that I reared from hatch (day 1). They are very sweet, they get along very well with me and my daughter and the other ducks they are housed with. They are very small but are very hardy for their size. In fact they don't seem to notice that they are smaller than the other ducks at all! They are absolutely beautiful and their color is stunning. Hi I have been raising black East indie ducks for two years now and I've had an amazing experience with them . They are extremely friendly I've never had any experience with aggression we pet ours all the time I have two small children that they follow around . Ours free range on our property with are two German Shepherd's for protection and as soon as they see us coming they either fly over to us or start quacking . We have a family of 10 of them three boys and seven girls we absolutely love them they're great family pets ! I have beautiful gardens everywhere they do not do too much damage to the gardens I honestly could never see myself without them ! These were our first ducks and have only ever been a delight and never a problem. Exceptionally beautiful, they are definitely an ornamental breed only. The laying period is only two months of the year (usually may/june). I did try the eggs but they are, even for a duck egg, too strong to be pleasant. They don't like to be picked up so we only handle them when necessary but they have only ever been aggressive when sitting or protecting ducklings. The drakes are hugely attentive towards the ducks/ducklings and the group has an obviously strong bond, regularly chasing off my chickens when they get too close. We have never had any health problems and mostly leave them to get on with their own devices with as little interference as possible. This also seems to be the best strategy when it comes to breeding, and when left alone they have proved great mums. One even adopted a wild mallard orphan duckling someone had brought to us.